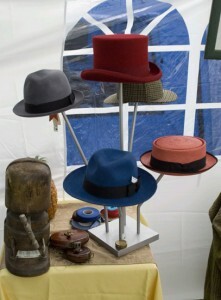 Hats an’ Bluegrass; Hats On! 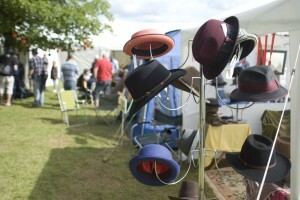 Last weekend we took our new Gentleman’s Hats venture to Didmarton Bluegrass Festival on Kemble Airfield in Gloucestershire… This is because Jules Bushell, champion of ‘The Gentleman’s Area’, is also a musician who plays double bass (mandolin, saw, phonofiddle etc…. )with several bands. We set up a Gentleman’s Front Room with our new range of hats from Christys, a rug, wind-up gramaphone and some 78s, and, of course, some tartan blankets…. It was a great way to make some new friends, not least at the Ogri Bikers Clubhouse and bar, and well-stoked camp fire which burnt all night long…. 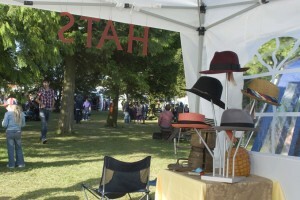 The first thing we did on return was to re-stock ready for Cornwall Bluegrass in two weeks time, the hats were very popular! 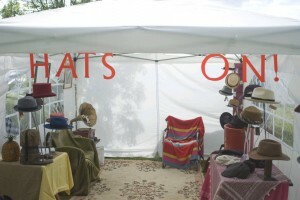 It was amazing to meet so many new friends and bring along our own style. Sadly I did not make enough cash for a banjo, Jules is safe!